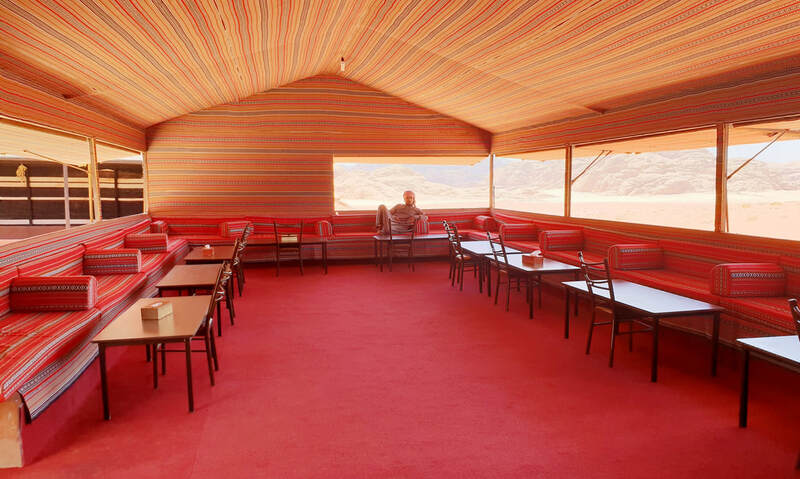 Our big dining tent has large windows that open on three sides to let the desert breeze cool the air in summer. The view arcs from south-west to north-west, across an expanse of sand, and provides year-round views of the sun setting over distant mountains. We serve your meals in the big tent, and tea and coffee and cool drinks are available on your arrival and throughout the evening. You can relax and enjoy a cup of tea, chat with fellow travellers, and take in the amazing view. We serve dinner after sunset in summer and around 7.00pm in winter. ​Breakfast is served at 7.00am. There is a power point and USB points for you to recharge your phones. 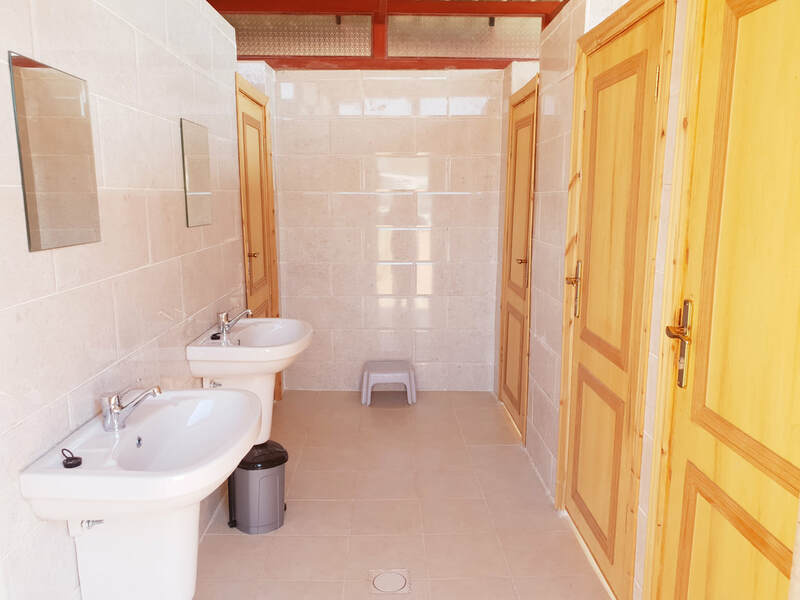 We have 10 sleeping tents, the exterior made with the black and white goat hair material used for traditional Bedouin tents, and interior is fabric walls and lino flooring. Each tent has two, three, or five single beds, or a double bed, and can accommodate up to 22 people in total. Dinner and breakfast are served buffet-style in the dining tent. The food is healthy, a mixture of Jordanian favourites and traditional Bedouin cooking. ​When we have many visitors we prepare a Bedouin BBQ, or zarb, for dinner. In Arabic, زرب . Meat and vegetables are cooked under the ground and the food tastes delicious. You are welcome to watch when we take this meal out of the of the ground. The bathrooms are shared, and we have separate bathrooms for men and women. Hot and cold water are available. The hot water is solar-heated and dependent on sunny weather. The cold water is not so cold in the middle of summer.